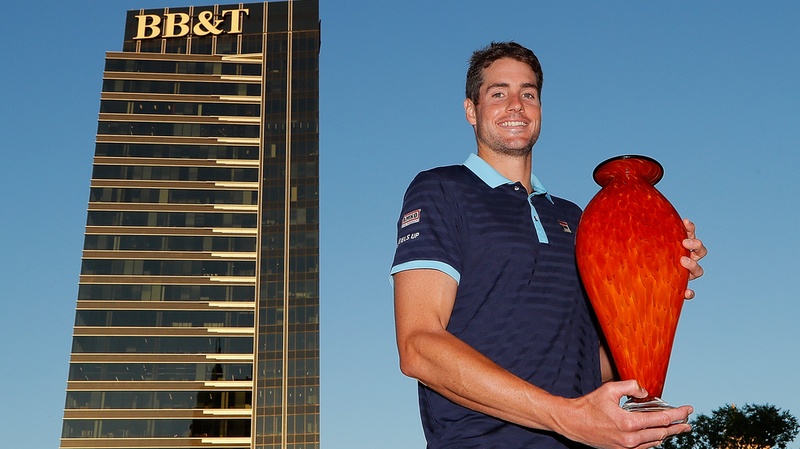 It is somehow fitting that two Americans collided in the final BB&T Atlanta Open. This was the leadoff event in the 2017 U.S.Open Series and those who live in the United States and follow tennis closely were thirsting for players from their country to celebrate success on the hard courts in Georgia. They were hoping that this tournament would showcase the talent of men who were born and bred on American soil. They almost surely wanted to witness a title round contest between two players who hail from this country, to cheer them on with unbridled passion and deep appreciation. They understandably wished that a clash of Americans would occur and had a clear preference for a hard fought battle with the outcome in doubt from the beginning to the end. That is precisely what happened as a revitalized John Isner came up against countryman Ryan Harrison on Sunday afternoon in a suspenseful final. Harrison gave himself every chance to succeed and Isner was stretched to his limits before the big man prevailed 7-6 (6), 7-6 (7). Harrison was somewhat unlucky to lose. The 25-year-old had set points in both tie-breaks but he did not squander them. The 32-year-old Isner elevated his game at those critical junctures, and before demonstrated that his self conviction and mental toughness have seldom been stronger, and ultimately came away with the title because he was the better man on the biggest points. It was almost as simple as that. And so the big fellow has won eight matches in a row. He ruled comprehensively the week before on the grass courts of Newport, Rhode Island at the Dell Technologies Hall of Fame Tennis Championships. He had not won any ATP World Tour events since he took his third crown in Atlanta two years ago. By backing up his triumph on the Rhode Island grass with a victory on the hard courts of Atlanta, Isner realized a feat he had never achieved before in his remarkable career. For the first time as a professional, he has captured two titles in a row. Making this accomplishment all the more impressive is the fact that Isner had been having a tough time this season. Prior to Newport, he seemed jaded, devoid of confidence, and uncertain about how to snap out of a long slump. He looked slower, muddled in his mind about how to impose himself, and out of step with the way he once won—by picking apart his opponents methodically with sustained power and outstanding serving. Isner played in 13 tournaments and Davis Cup from the start of the year through Wimbledon. His match record was a disconcerting 16-14. The only time Isner seemed to rediscover his old recipe for success was on the clay courts in Rome at the Italian Open. In that tournament, he made it all the way to the semifinals with wins over Stan Wawrinka and Marin Cilic before he was toppled by Alexander Zverev. Otherwise, however, the towering American was a diminished figure out there on the circuit. At Wimbledon he was inexplicably beaten in five sets by Dudi Sela. Sela has no business beating Isner on a grass court, particularly over the best of five sets on the lawns of Wimbledon. But Isner is now revitalized. He did not lose his serve or drop a set in Newport. He surged into the final round of Atlanta without losing a set or his serve. In the semifinals, he took down the tenacious left-hander Gilles Muller 6-4, 6-2, breaking his formidable adversary three times, returning serve with automatic authority and extraordinary aggression. Against Harrison in the title round contest, Isner knew he was in for a potentially difficult and emotionally taxing test. Isner led in their career series 5-2, but had lost their most recent skirmish last summer in Toronto at the Masters 1000 event there. Harrison was in the early stages of an impressive comeback at that time, and earlier this year the determined and industrious American won his first ATP World Tour tournament (at the 250 level) in Memphis. He went on to take his first major, securing the French Open doubles alongside Michael Venus. Both Isner and Harrison were primed for this showdown. They came out on court and performed with clear-mindedness and sound execution from the outset. Isner missed three out of four first serves in the opening game of the match but held at love as Harrison got only one return back into play. Harrison answered with a love hold of his own, serving a pair of aces to close out that game. Isner went to 2-1 without losing a point on his delivery, serving-and-volleying twice and releasing an ace in that game. Harrison was undismayed. He held convincingly at love for 2-2. In four games, not a point had gone against the server. Isner advanced to 40-0 in the fifth game, dropped the next two points, but aced Harrison down the T at 40-30. That gave the favorite a 3-2 lead. Harrison was taken to 30-30 in the sixth game but Isner missed a second serve return off the forehand. Harrison held on for 3-3. Both men were sedulously protecting their deliveries, giving little away, playing hard court tennis the way it should be played. Isner surged to 4-3 with another love hold but an ace out wide at 40-15 in the following game brought Harrison back to 4-4. Isner remained unshakable, holding at love for 5-4 with three aces. Serving to stay in the set, Harrison did not blink, holding at love. Isner was now preoccupied with a knee related issue, and he wasted a 40-0 lead in the eleventh game. Harrison worked his way back to deuce. A wide serve set up a winning forehand down the line for Isner, who reached game point for the fourth time. Harrison coaxed an error from his older compatriot before Isner released an ace for a fifth game point. Once more, Harrison rallied for deuce but an obstinate Isner took two points in a row to reach 6-5. A trainer came on court to look at Isner's knee and leg. Harrison then proceeded to hold at 30 for 6-6. The set would fittingly be settled in a tie-break. Isner commenced the sequence abysmally with his lone double fault of the match but reached 1-1, crushing a blazing forehand winner down the line. After Harrison aced Isner for 2-1, the taller man secured three straight points to establish a 4-2 lead. But he lost the next three points. Harrison served with a 5-4 lead but missed a backhand crosscourt, driving that shot cleanly and aggressively but missing it long. Harrison won the next point on his own serve for a 6-5 lead, forcing Isner to serve at set point down. Isner was unwavering in this clutch situation, coming forward behind a flat forehand down the line approach, forcing Harrison into an errant backhand passing shot. That made it 6-6. Isner followed with a terrific second serve down the T that Harrison could not handle on the return. Now Harrison served at 6-7, missing his first delivery. Isner was bold on his second serve return off the forehand, driving it forcefully into an empty space for an outright winner. Isner had prevailed eight points to six. He led one set to love. And yet, Harrison was not out of sorts. He held from deuce in the opening game of the second set. With Isner serving at 30-40 in the second game, Harrison came through with meticulous craftsmanship. Isner serve-volleyed and deliberately played his backhand first volley low and short crosscourt. Harrison sent a backhand passing shot down the line, clipping the sideline for a picture-perfect winner. Isner's streak of 75 consecutive service games held was broken. Harrison had given himself a nice opening as he moved in front 2-0 in the second set. The younger American seemed poised to possibly take the match into a third set. But he was cautious in the crucial third game. At 30-30 he left a shot in the middle of the court with not enough relish on it. Isner walloped a forehand winner for break point. Harrison saved that one but Isner kept the pressure on an opponent who may have been a little too conscious of the score. Isner broke back for 1-2 and held at 15 for 2-2. In the fifth and sixth games, both men held at love. Harrison held again at love for 4-3. Isner retaliated by holding at 30 with his 15th ace. It was 4-4. From 15-30 down, Harrison moved to 5-4 but Isner released his 16th ace, sending that delivery down the T to hold at love and knot the score at 5-5. In the eleventh game, Isner seemed likely to break serve when he opened up a 0-30 lead, but Harrison was admirable here, producing a service winner and an ace for 30-30, sweeping four points in a row to advance to 6-5. Isner raised his ace total to 18 as he held at love for 6-6. In an intriguing second set, each man had broken once, but now they would determine the outcome in another tie-break, which seemed awfully fitting under the circumstances. As was the case in the first set tie-break, Harrison had his chances. He served an ace down the T to open the sequence and then went ahead 2-0, chasing down a drop volley from Isner, chipping a backhand low crosscourt and fielding Isner's reply beautifully, punching a backhand volley down the line into a vacant court. Isner then served his 19th ace, but Harrison took the next two points to extend his lead to 4-1. Isner wanted to avoid a third set at all costs and get this job done in straight sets. His 20th ace took him to 2-4 and an unstoppable first serve down the T made it 3-4. Harrison was momentarily shaken, making a backhand unforced error for 4-4. But he aced Isner down the T for a 5-4 lead. Now the 6'10" American displayed his match playing class and his character under duress. Harrison made an excellent crosscourt return, getting commendable depth on that shot. But Isner stepped in and timed his backhand down the line response impeccably, moving in behind it and putting away a forehand volley for 5-5. His 21st ace took Isner to match point at 6-5 but Harrison averted great danger to save it. Isner's weak return hit the net tape and fell over the net, but Harrison alertly came forward and flicked a forehand winner behind his adversary for 6-6. They changed ends of the court, and Harrison coolly sent a service winner down the T for 7-6. It was set point for him. Isner was nothing less than magnificent at this stressful moment. An ace out wide in the ad court made it 7-7 and an ace out wide in the deuce court—his 23rd of the skirmish— brought Isner to 8-7 and a second match point. This one he converted stylishly, going down the line off the forehand with precision, leaving Harrison hard pressed and unable to respond on the run. Isner had triumphed in a pair of demanding tie-breaks to raise his record in those sequences to 30-17 on the season. His composure at the end of both tie-breaks was striking. He has won four of his twelve career ATP World Tour singles titles in Atlanta. Isner has clearly emerged from his long slump across the first half of 2017 to play some of his most inspired tennis in a very long time. I hope he paces himself over the rest of the summer. In ten previous appearances at the U.S. Open, he has been to the quarterfinals only once. With the right kind of draw this year and the energy he will need to find the necessary inspiration, John Isner could have his best Open yet. I hope he can avoid the pitfalls of too many previous years when he wore himself out competitively before he got to New York. This time around, it would behoove John Isner to save the best tennis he has in him for the last Grand Slam championship of the season. American sports fans would be delighted to see him do just that.